Photograph of Diamond Jubilee celebrations at Central Park. Miss Canada, Jean Cameron is on a float with other young women representing each province of the Dominion. Note the paper mache beaver pulling the throne. 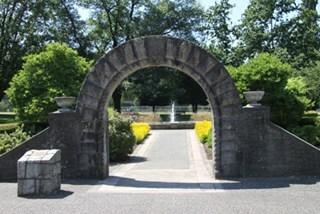 The event was held on July 2, 1927 with a parade from the Municipal Hall at Edmonds along Kingsway to Central Park. Memorial services for those who died in the Great War were held at the Municipal Hall and the Memorial Hall, on Royal Oak. 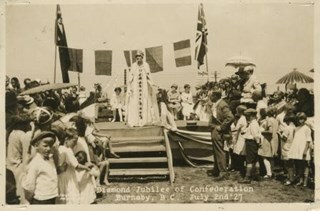 Annotation at bottom of photograph reads, "Diamond Jubilee of Confederation / Burnaby, B.C., July 2nd '27"
Back of photograph stamped, "Lloyd's Studio / 3966 Kingsway / McKay, B.C., Carl. 343R2"
Photograph of the Burnaby May Day procession at Central Park. 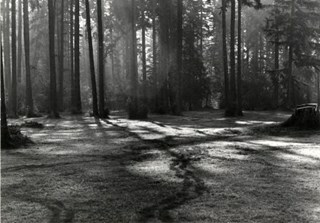 Photograph shows the morning dew on the ground in Central Park. 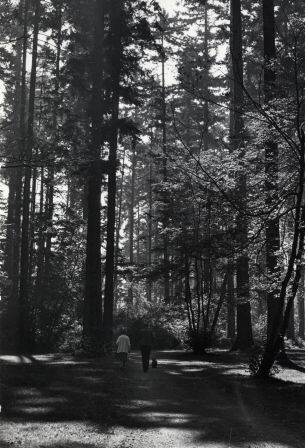 Photograph shows a couple walking their dog in Central Park. 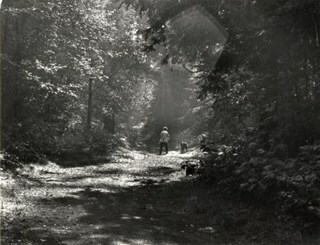 Photograph shows a woman walking her dog in Central Park. 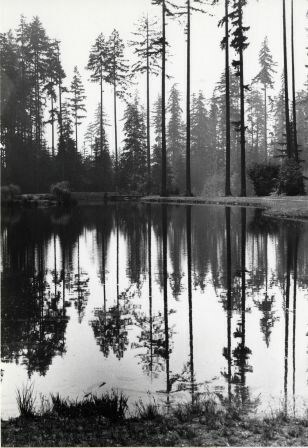 Photograph shows reflections in one of the two ponds in Central Park. 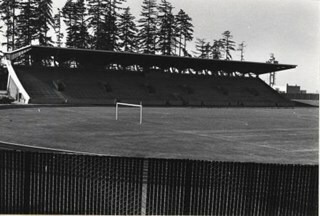 Photograph shows Swangard Stadium in Central Park. 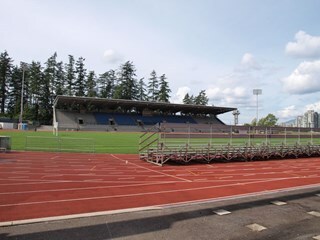 The stadium was official opened in 1969. Photograph of a group of twenty-five middle aged men dressed in suits, vests and hats, in Central Park in Burnaby. They all have ribbons pinned to their lapels. The information written on the ribbons is not visible. A note on file at the Burnaby Village Museum indicates that this group may have been a fraternal lodge group. Photograph of the crowning of the May Queen at the first May Day celebration in Burnaby in 1925. The suite is gathered on the platform for the crowning. There are chairs on the stage, however, people are standing. A page boy can be seen standing at the other edge of the stage, dressed in velvet costume. Crowds gathered to watch the ceremony are also visible. 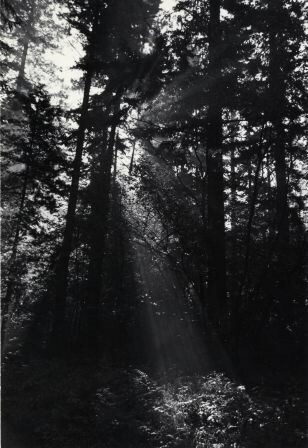 Inscribed in the original negative and printed on the photograph, bottom front: "Burnaby's First May Day 1925 / #7 / Stride Photo." Photograph of the crowned May Queen at the first May Day celebration in Burnaby in 1925. The suite is gathered on a platform, along with men in suits and uniforms, and a page boy by the May Queen. Flower girls are sitting on the edge of the stage by the steps. here are chairs on the stage; however, people are standing. Crowds gathered to watch the ceremony are also visible. Inscribed in the original negative, and printed on the photograph, bottom front: "Burnaby's First May Day / 1925 / #8 / Stride Photo." 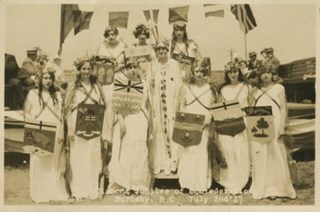 Photograph of the procession of May Queen Suite and other attendants at the first May Day celebration in Burnaby in 1925. Each girl in the suite is holding a flower basket and escorted by a man in a suit and matching hats. A flag flying in the back and a water tower can be seen from behind the procession. Guards and crowds are also visible. Annotation on the back of the photograph read: "Ruth Byrne [sic] [the first May Queen in Burnaby, leading the procession], Jessie, Margaret McCulloch, Eileen Jacques"
Second annotation reads: "Reeve A.K. McLean, Mrs. John Hawkshaw in white turban." Inscribed in the original negative, and printed on the photograph, bottom front: "#11 / Burnaby's First May Day 1925 / Stride Photo." Photograph of the procession of the May Queen and her suite at the first May Day celebration in Burnaby in 1925. Leading the procession is a page boy in a velvet blazer, holding a flower crown on a cushion. Following him is a group of flower girls. Then the May Queen, and her attendants follow, some of them escorted by a man in a suit or a uniform. Each girl in the suite is holding a flower basket. A large crowd is gathered to watch the procession. Also note, in the foreground, right corner of the photograph, is a boy in a scout uniform, holding a flagpole. Inscribed in the original negative and printed on the photograph, bottom front: "Burnaby's First May Day 1925 / #2 / Stride Photo." Photograph of the May Queen and her first maid on a stage at the May Day Celebration in Burnaby in 1933. The two girls are standing in front of a microphone, and the rest of the girls in the Queen's suite are seated on chairs beside the stage. There are other girls and boys crowding behind the stage. Two older men in suits are flanking the stage. There are two union jacks flying behind the stage. Inscribed in the negative and printed on the photograph, bottom front: "May Day Celebration / Burnaby, B.C., May 20, 1933 / Stride Studios Photo / #7." Photograph of the May Queen and her suite marching off the stage at the May Day Celebrations in Burnaby in 1934. Leading the parade is a flower girl, followed by the May Queen, then the rest of the suite, each escorted by a man in a suit. There are two union jacks flying behidn the stage, and crowds are gathered around the stage to watch the parade of the May Queen Suite. Inscribed in the negative and printed on the photograph, bottom front: "13 / May Day Celebration / Burnaby, B.C., May 26th, 1934 / Stride Studios Photo." Photograph of a group of girls each holding a ribbon from the Maypole in her hands, getting ready for the Maypole dance at the May Day Celebration in Burnaby in 1935. They are wearing white dresses with a white flower or ribbon in their hair, and strap shoes. There is a crowd of people gathered behind them to watch the dance. Inscribed in the negative and printed on the photograph, bottom front: "May Day Celebration / Burnaby, B.C., May 6th, 1935 / Stride Studio Photos / #4." 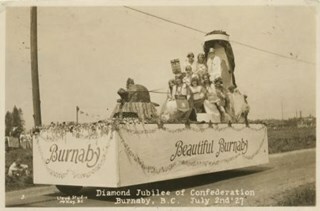 Photograph of the parade of the May Queen and her suite at the Burnaby May Day Festival in 1931. 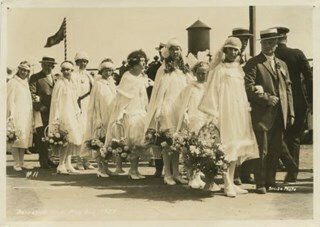 The flower girls are leading the parade with flower baskets in their hands, followed by the May Queen, and her suite, each escorted by a man in a suit. In the distance, a crowd of people can be seen. This may be Central Park. Photograph of the First Central Park Troop of Boy Scouts. They are wearing uniforms and posed outside in front of bleachers at Central Park. There are 28 boys ranging in age from about seven to twelve, and four adults. A boy in the back row is holding a Union Jack with a circle in the middle in which is written, "B.P.B.S. / 1st / Central Park / Troop." 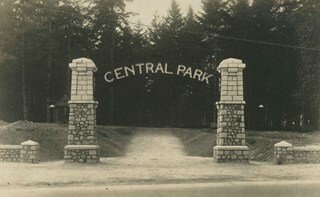 A caption printed on the bottom front of the frame reads, "First Central Park B.P. Boy Scouts, Central Park, B.C." A annotation on the back of the photo reads, "Mr. Robertson." See HV973.152.2 for another photograph of the first central park BP boy scouts. Photograph of the First Central Park troop of Boy Scouts. All but two of them are in uniform, standing at attention. There are 22 boys and 7 men. A man in the centre is holding a flagpole with a Union Jack attached. The Boy Scouts are standing on a cleared field behind which is a building and forest growth. The location may be Central Park. 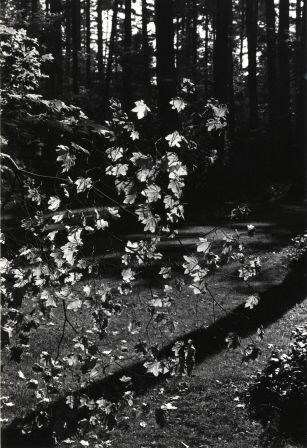 A caption printed on the bottom front of the frame reads, "First Central Park / B.P. Boy Scou [sic] / 1910." Printed on the lower right front of the frame, "W. Brown, Photo. 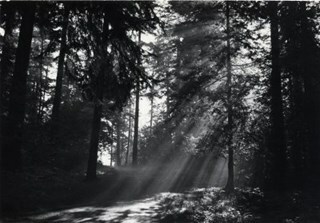 / New Westminster, B.C." See HV973.152.1 for another photograph of the first central park BP boy scouts. Photograph of the first May Day celebration in Burnaby featuring a march led by boy scouts at the front, with flower girls and the May Queen and her suite following behind. A group of women are standing in the foreground in front of a long row of chairs, with a boy in a sailor suit and a young girl in a dress. A large crowd fills the surrounding area. Photographer's writing on recto of photograph reads: "Stride Photo / # 1 / Burnaby's 1st May Day 1925"
Note in pencil on verso of photograph reads: "Roy Raymer"
Photograph of various flower displays with signs that indicate the prize they earned at the 14th Annual Central Park Agricultural Association and Farmers's Institute Exhibition. There are at least three First Prize flower displays in view and one Special Prize. This is most likely at the 14th Annual Exhibition of the Central Park Agricultural Association and Farmers' Institute that took place from the 17th to 19th of September, 1914. An earlier catalogue record from 1988 notes that the pictures hanging from the backwall are probably children's school work from Kingsway West School. 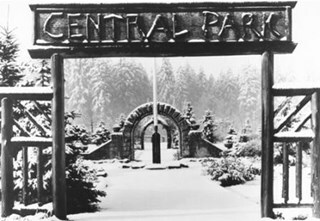 It also adds the agricultural fair was held between 1902 to 1921 in the Central Park Agricultural Hall built in 1902 in Central Park on Kingsway and the B.C.E.R. tracks. For photographs of vegetable displays at the agricultural exhibition, see HV972.11.3 and HV972.11.17. Photograph of the procession to the retiring Queen during Burnaby's May Day at Central Park. Young women in white dresses are being escorted across a field by men in three-piece suits. A crowd, maypoles, a water tower, and house rooftops can all be seen in the background. Inscribed on the negative and printed on the photograph, bottom front: "#1 / Burnaby May Day Celebrations / 28/5/27 / Lloyd Studio, McKay. B.C." Photograph of the motorcade of Edward VIII, Prince of Wales, at Central Park during his 1919 visit to Canada. There are automobiles driving under the arch and flags displayed on top of the arch. Photograph of the celebration of the Diamond Jubilee at Central Park. 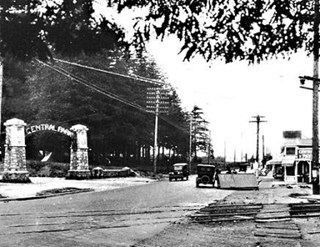 The event was held on July 2,1927 with a parade from the Municipal Hall at Edmonds along Kingsway to Central Park. Memorial services for those who died in the Great War were held at the Municipal Hall and the Memorial Hall, Royal Oak. Shown in this photograph is Reeve Bennett (Vancouver) addressing the crowd. Also on the dais are: ex-Reeve J.W. Weart, ex-Reeve T. Sanderson, Councillor Grimmett (Vancouver), Councillor Hall (Vancouver), Councillor Buckingham (South Vancouver), Burnaby's May Queen and suite, Leon Ladner (M.P. ), and Miss Jean Cameron as "Miss Canada." Annotation at bottom of photographs reads, "Diamond Jubilee of Confederation / Burnaby, B.C., July 2nd '27"
Back of photographs stamped, "Lloyd's Studio / 3966 Kingsway / McKay, B.C., Carl. 343R2"
Photograph of the celebration of the Diamond Jubilee at Central Park. 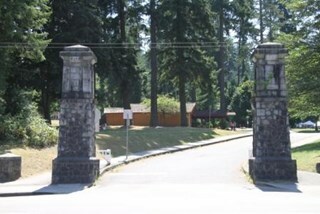 The event was held on July 2, 1927 with a parade from the Municipal Hall at Edmonds along Kingsway to Central Park. Memorial services for those who died in the Great War were held at the Municipal Hall and the Memorial Hall, Royal Oak. Shown in this photograph is MP Leon Ladner addressing the crowd. Also on the dais are: ex-Reeve J.W. Weart, ex-Reeve T. Sanderson, Reeve Bennett (Vancouver), Councillor Grimmett (Vancouver), Councillor Hall (Vancouver), Councillor Buckingham (South Vancouver), Burnaby's May Queen and suite, and Miss Jean Cameron as "Miss Canada." 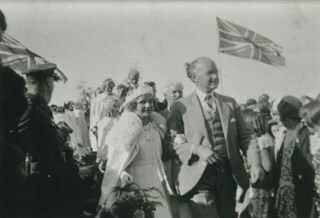 Photograph of the celebration of the Diamond Jubilee at Central Park. The event was held on July 2, 1927 with a parade from the Municipal Hall at Edmonds along Kingsway to Central Park. Memorial services for those who died in the Great War were held at the Municipal Hall and the Memorial Hall, Royal Oak. Shown in this photograph are Miss Canada, Jean Cameron, and other young women representing each province in the Dominion standing on the stage. Also on the dais are: ex-Reeve J.W. Weart, ex-Reeve T. Sanderson, Reeve Bennett (Vancouver), Councillor Grimmett (Vancouver), Councillor Hall (Vancouver), Councillor Buckingham (South Vancouver), and MP Leon Ladner. 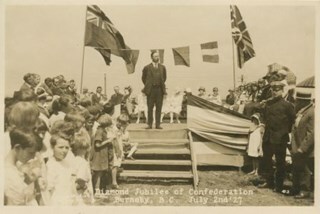 Photograph of the celebration of the Diamond Jubilee at Central Park. Miss Canada, Jean Cameron, is addressing the crowd. Also on the dais are; ex-Reeve J.W. Weart, ex-Reeve T. Sanderson, Reeve Bennett (Vancouver), Councillor Grimmett (Vancouver), Councillor Hall (Vancouver), Councillor Buckingham (South Vancouver), Burnaby's May Queen and her suite and MP Leon Ladner. The event was held on July 2, 1927 with a parade from the Municipal Hall at Edmonds along Kingsway to Central Park. Memorial services for those who died in the Great War were held at the Municipal Hall and the Memorial Hall, on Royal Oak. 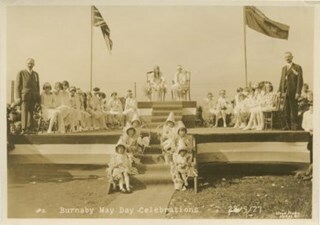 Photograph of young women and girls seated on chairs on a stage for the Burnaby May Day celebrations. Two young women are seated at the top centre of the stage, six flower girls are seated on the stairs leading up to the stage, and a man is standing on either side. Annotation at bottom of photograph reads, "#2, Burnaby May Day Celebrations, 28/5/27"
Back of photo stamped, "Lloyd's Studio / 3966 Kingsway / McKay, BC, Carl. 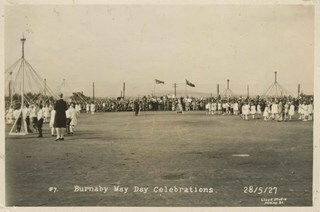 343R2"
Photograph of Burnaby May Day celebrations including a field with children maypole dancing and a crowd watching. A stage is at the back centre under the flags, and there is a photographer with a tripod at the centre of the field. 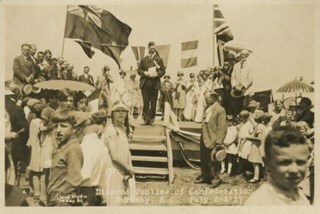 Annotation at bottom of photograph reads, "#7, Burnaby May Day Celebrations, 28/5/27"